You don't have to purchase sliced or minced garlic in a jar. You can prepare your own garlic! Learn how to select and prepare garlic with our helpful how-to tips. When you're at the grocery store, find a nice, heavy head of garlic. It should be firm and heavy for its size. You need to break the garlic up into cloves. On a cutting board, give the garlic a little push with the palm of your hand and it will break into cloves. You'll generally have 10 - 12 cloves in each head. Take one of the cloves and hit it with the side of your knife. You can then peel the skin. 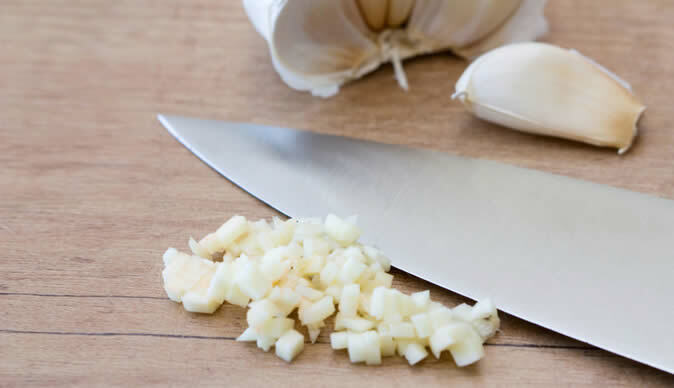 To mince the clove of garlic, make lengthwise cuts with your chef's knife down one side. Flip the garlic over, cut it once and then you'll be able to chop it into fine pieces. Discard the root and you're done! You can also thinly slice garlic if your recipe calls for sliced versus minced garlic. To save time in the future, peel the skin off all the cloves of garlic and store them in an airtight container in your fridge. Sometimes you'll see a green stem inside the clove when you cut it in half. There's nothing wrong -- it just means the clove is getting older. Pull it out and discard it. Also, store the garlic in a dark, cool place. And that's all there is to it! Now you can use fresh garlic in all of your recipes.